Ngaga Camp is set in a beautiful rainforest glade by the banks of the Ngaga Stream. There are views towards the lush forest canopy from all parts of the camp. This area is inhabited by several groups of lowland gorillas making it an excellent base for tracking these fascinating animals. Indeed, Ngaga is widely recognised as one of Africa's foremost gorilla research destinations. The central part of the camp consists of the sitting area and bar and the separate dining area, where you'll spend time relaxing between wildlife and cultural activities. There's a deck by the stream, which is ideal for refreshing swims, and a further deck near the firepit, a favourite place to sit after dark and watch the stars. Guest rooms are built from natural materials such as wood, palm matting and bamboo and their design uses elements of the style of local B'Aka Pygmy homes. They are set on high wooden platforms set among the trees. Modern features include a bathroom with a shower and flush toilet and fans to circulate the air and keep the temperature comfortably cool. Rooms are set on raised platforms and have spacious verandas. Open: Ngaga Camp is open all year. Location: Ngaga Camp is located on the western border of Odzala-Kokoua National Park in the north west of the Republic of Congo. It is in the Ndzehi forest. Access is via the Mboko airstrip, about a 3-hour drive from the camp. The flight from Brazzaville takes 2-3 hours, depending on refuelling stops. Rooms: There are 6 treehouse rooms, accommodating a maximum of 12 guests. Rooms are set on raised decks and have views into the surrounding forest canopy. All are en-suite with hot and cold running water, a shower, flush toilet and selection of toiletries. The bedroom is equipped with mosquito nets, a fan and power points. Activities: The main activity and reason for visiting Ngaga Camp is to track gorillas. There are several groups of gorillas, 2 of which, named Jupiter and Neptuno, are the focus for habituation and tracking. These have between 10 and 25 individuals each and are led a silverback male. You are assigned a group and set out on foot with an expert guide and a local tracker to search for them. 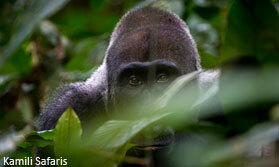 Though sightings are not guaranteed your guide and tracker will do their utmost to help you see the gorillas. Once you have found them youl have an hour to spend watching them, time which will pass very quickly. There are many other primates in the forest, plus mammals and a high concentration of birds. The camp offers night walks to observe nocturnal species. Youâ€™ll be able to visit the local village at Ombo, to meet the people and learn about their daily lives. Facilities: Communal areas comprise the cosy lounge and bar and the dining room, set on a raised platform looking out into the dense forest. There is a lower deck for star gazing and a camp fire where you can enjoy after dinner drinks. The camp offers a complimentary laundry service. There is solar-powered electricity and points for recharging batteries. There is a back-up generator.